This is the ultimate and blesséd paradox of choral singing I was reminded of during my time with the students and staff of Bexley High School. I usually walk into clinics hopeful of some sort of weird magic to happen in the hearts of everyone, but when it happens like a joyful flood, it transfixes and holds… every smile, every hug, every word, every sound that comes forth is with the purpose to build, to create, to support. Is this possible with teenagers? With anyone, these days? I guess so, and I got the unbelievable honor to share and be immersed in it. I met Amy Blosser a couple years ago in the Walton booth at an American Choral Directors Association convention. They happened to bring a piece of mine called “the Sweetheart of the Sun” on tour with them to Europe and it had been a special and meaningful piece for the the students. (by the way, this is humbling to hear as a composer. I will always trade tears for cheers in a choral experience) We talked and talked through the possibility to work together on a commission and then unite that with a visit to the school to be with the students. 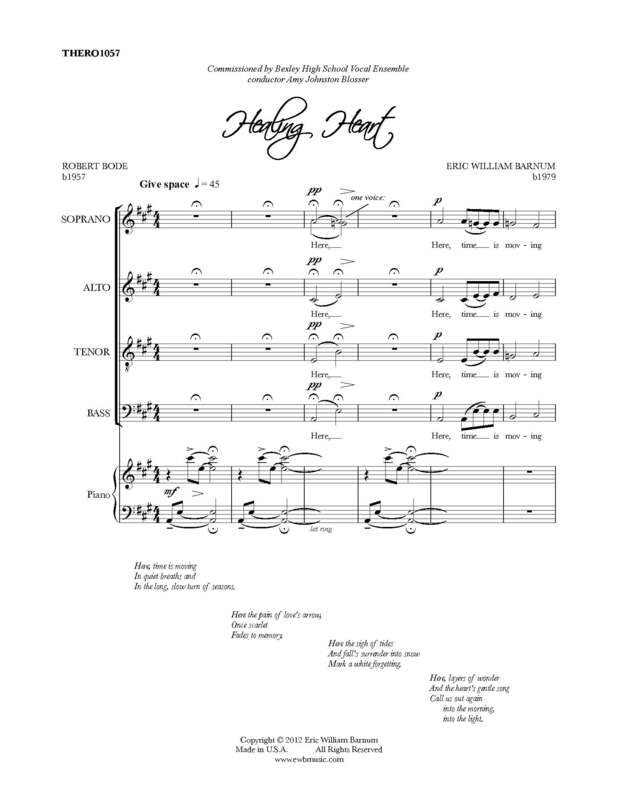 I decided on a text by my beloved friend Robert Bode (DCA at UMKC), who is currently the Hammerstein to my Rogers, called “Healing Heart.” Amy and I talked about the Vocal Ensemble, who it was written for and I wanted to write them something completely unique, something vulnerable, something tough. …and out it came. When they performed it the first time for me, I cried. So… this usually happens on the second day, not the first moment! From the first sound from these beautiful faces, these miraculous hearts were opened to me. I felt lucky to even share the air with these people. Their eyes were something else. I want to highlight two people. Amy Blosser (director) is a wonderful choral musician and singer. Her students respect and revere her and their singing reflects her warmth and intent. More importantly, she is a wonderful and caring human who has dedicated herself to the divine choral cause and selflessly gives major time to America’s national choral association. I am blessed to call her friend. I also want to mention my love for Bexley’s accompanist Casey Cook. It is truly a rare thing to meet a pianist who can read minds. They are here and there, but this woman is a bit of a magician. When a conductor meets these wonderful musicians, it’s hard to not to want them around all the time for everything. Mind readers, and they always (always!) save you and make you look amazing. I know Amy would agree. And! I got the chance to single Casey out and embarrass her in front of the student’s parents, who gave her the thanks she well deserves and will always deserve. In the end, I got the chance to work with choirs of all ages, including the beautiful 8th grade choir directed by Sue Wiechart White (I’d like to congratulate this wonderful woman on an amazing and splendid career of service. This is her final year. It was my honor to meet her.) From the Men’s and Women’s Glee, the Women’s Choir, to the Symphonic Choir, every group was filled with a spirit that is hard to describe, hard to capture, hard to say thank you properly. Let me mention the community as well… from the audience at the concert, to the celebration at the Horn family home, I felt loved and accepted as a friend. Finally, I want to share my thanks to the Vocal Ensemble and their work on this new piece which will receive a full premiere at the Central ACDA convention on March 9th, but more importantly for entering into a space with me that one cannot enter without being changed…without transfiguring (at least a little). I connected in a special way to a few students in particular and I thank you from the bottom of my heart. Thanks for talking to me, for letting me in. Remember what I said to you, remember my eyes, remember my heart. Thank you for giving everything …and getting in return… everything. In the end, I really do know what is important. It isn’t about my music. It never will be. If it is, someone punch me in the face. It is about eyes shining. It is about hearts crying. It is about hugging and knowing what it means to love.